Are you ready for the coolest brunch or breakfast entertaining concept ever? We start with Bloody Marys (as if that isn’t the best thing already), and then we add about a million garnishes at the bar so it is a build-your-own situation. 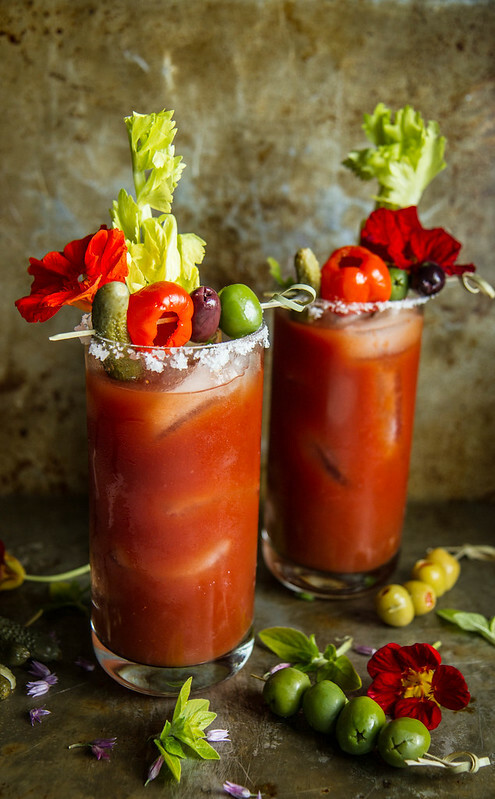 My picks for the ultimate bloody mary bar are a selection of olives, pickles, fresh and spicy pickled veggies, lemons and limes, prawns, even crispy bacon! And of course, I love a selection of salts to rim the glasses and tons of hot sauce!!! Having a ton of garnishes is mandatory for me- One of the things I love about Bloody Marys is the fact that it is not only a cocktail, but a freaking snack too! And these are basically a meal…. Ok, so once you have an amazing bloody mary, it’s rimmed with salt and has like 15 garnishes piled onto it- you have the option to SMOKE IT!!! I used this smoking box, which is not only a beautiful countertop appliance, but wow does it create a VERY cool party moment. I just pop these cocktails into the smoking box and let them set for a minute in the rich smoke and they come out with wonderful smokey dimension and so much flavor. So basically we have amped up these bloody marys to party trick level. 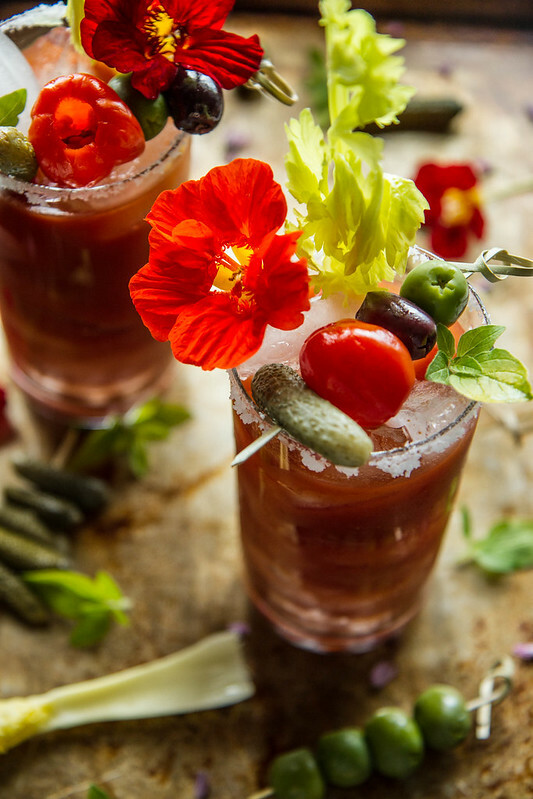 Even if you don’t smoke them, these bloody marys are going to rock your next brunch event! In the jar of a blender, puree the roasted red peppers until you have a puree. If they are difficult to puree, than add ½ cup of the vegetable juice. In a large pitcher combine the roasted peppers, the vegetable juice, the horseradish, celery seeds, Worcestershire and vodka. Mix really well and then season to taste with kosher salt. Fill glasses with ice and pour over the ice. Garnish as desired. Thank you again! Wish you a grat summer time! Good gracious those are gorgeous! And your right, the snacky part is almost as good as the drink.. I love a good Bloody Mary and this one looks ah-mazing! I can totally see how the roasted red peppers makes this drink! I’m married to someone who doesn’t like bloody marys, but that’s ok — more for me! 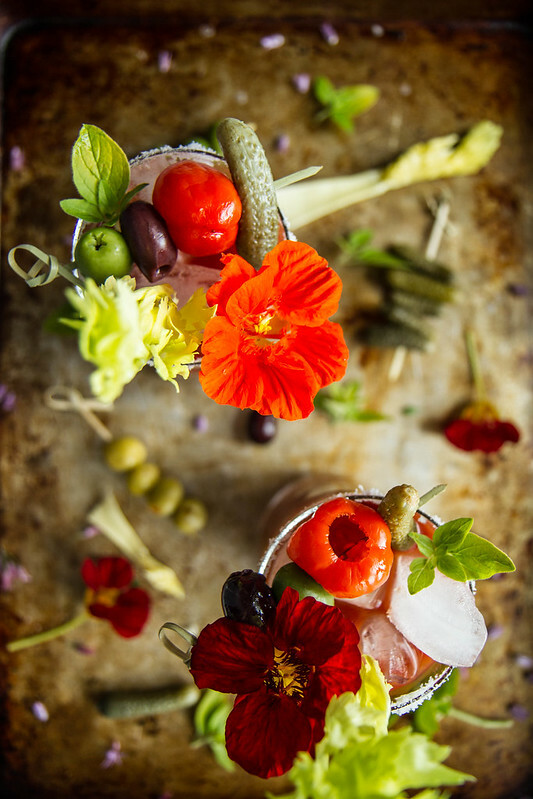 These sound delicious, and the garnishes are so gorgeous. This has GOT to be the most beautiful bloody mary I’ve ever seen! As opposed to some of those far-out drinks I’ve seen, I would love every garnish on this. The red peppers and the nasturtiums are particularly eye-catching. I’ll be making this very soon! That looks like a meal and drink all in one and so good. Can’t wait to try it! Sooo beautiful . Oh wow. This would be perfect today, it was so hot!